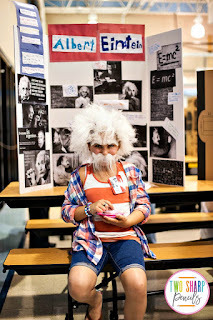 Have you ever wanted to try a classroom transformation but just didn't have the time or energy to make it happen? That's how we felt! 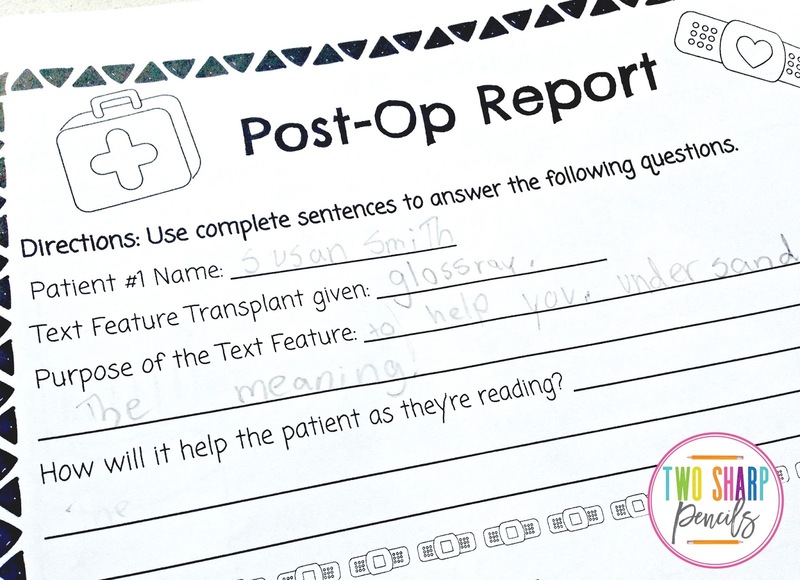 When we first saw the idea of a text feature surgery, it actually looked like something we could handle. 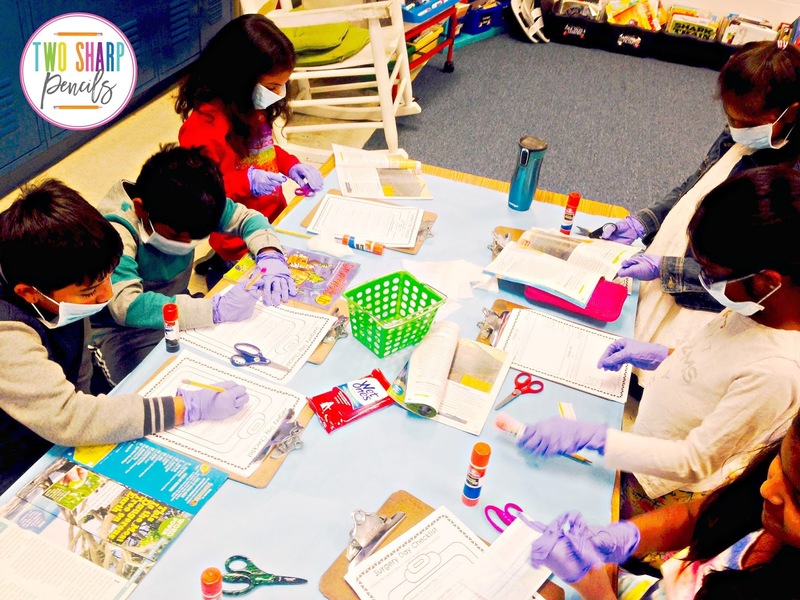 Throw down some blue butcher paper, add in a heart beat monitor video from YouTube, grab some medical gloves and a face mask and your class can experience this engaging activity too! Before we allowed our students to perform surgery, we treated them as "Surgical Residents" and had them go through Medical School. 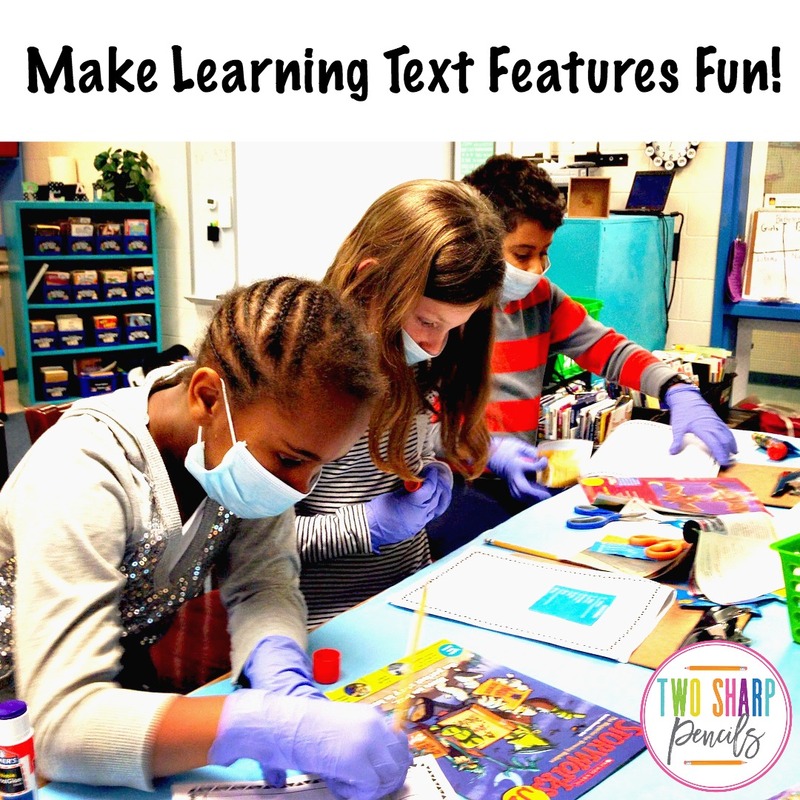 We spent a day or two learning about non-fiction text features, why they're important, how they help us as we're reading, and becoming experts on all things text features. We used this text feature chart with interactive notes to help us. 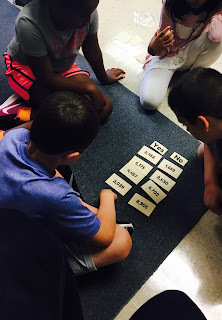 We also played a matching text feature game to practice. When we felt confident that our little residents understood the text features they would be using, it was time for surgery! We set up the classroom before students arrived so they would be excited from the moment they came in the door. It also helped us get through the morning routine quickly because they were so excited to start surgery. The setup was so easy! 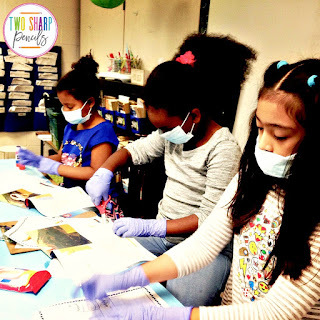 We simply covered the tables with blue butcher paper and stuck their gloves, face masks and wipes (for sanitizing their surgical tools) in a basket in the middle of the table. 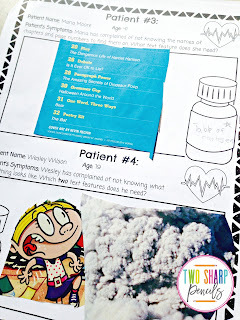 We also made sure that we had a StoryWorks magazine and surgery packet ready for every student. YouTube has lots of videos with heart rate monitors to add another realistic touch! We made a checklist of the steps our doctors needed to follow to perform their transplants so they knew exactly what to do. Of course, this started with cleaning/sanitizing their tools and reading the patient charts. 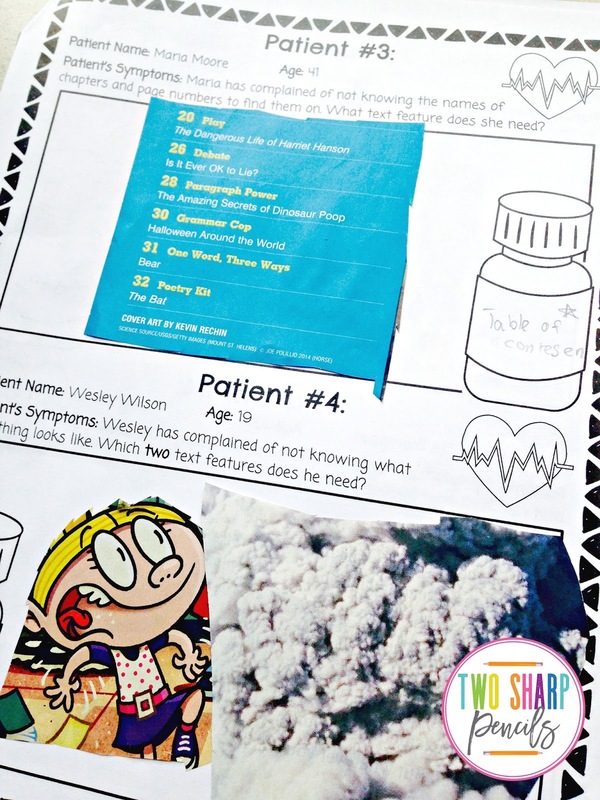 Each patient had a list of symptoms and students had to decide which text feature would help them based on their symptoms. 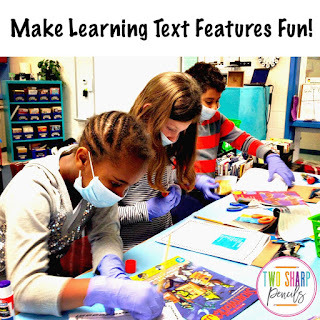 Then they had to find an example of that text feature in their magazine, cut it out, and glue it in their patient's file. 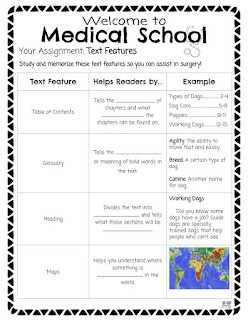 We designed our surgery like this because we felt it was more rigorous and required deeper thinking skills then just simply asking students to find a specific text feature and cut it out. 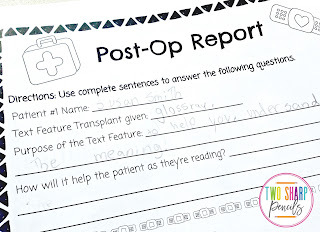 When they finished all 8 patients, we asked our surgeons to fill out their post-op reports on each patient. 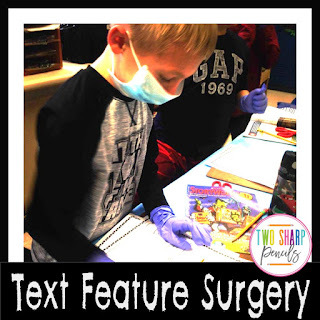 They identified the text feature transplant that they performed, the text features purpose, and how it would help their patient as they're reading. 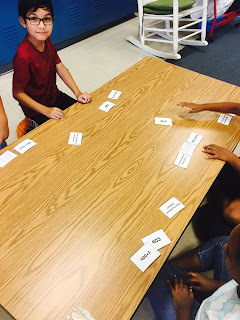 Our students LOVED this activity and we loved how it helped them have a deep understanding of text features. 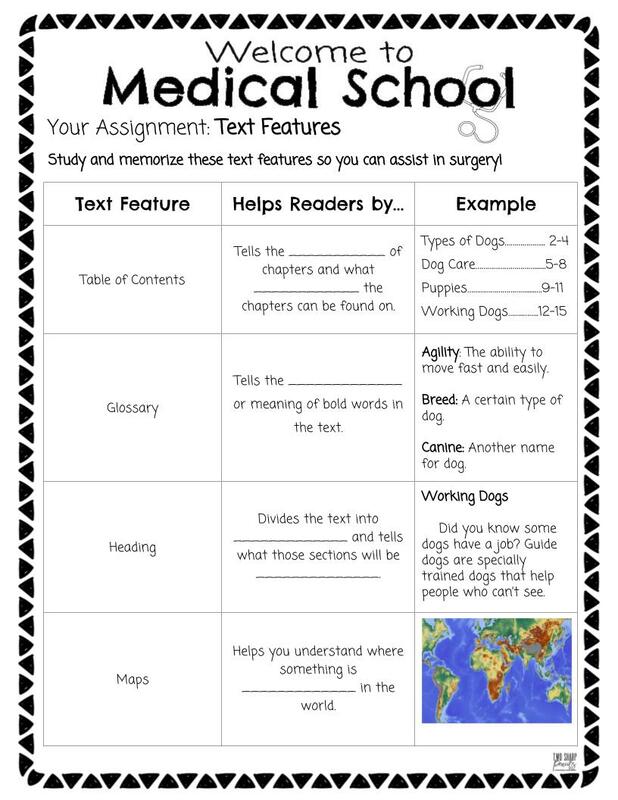 If you would like to try this out in your own classroom, click on the picture below to use our Text Feature Surgery product! 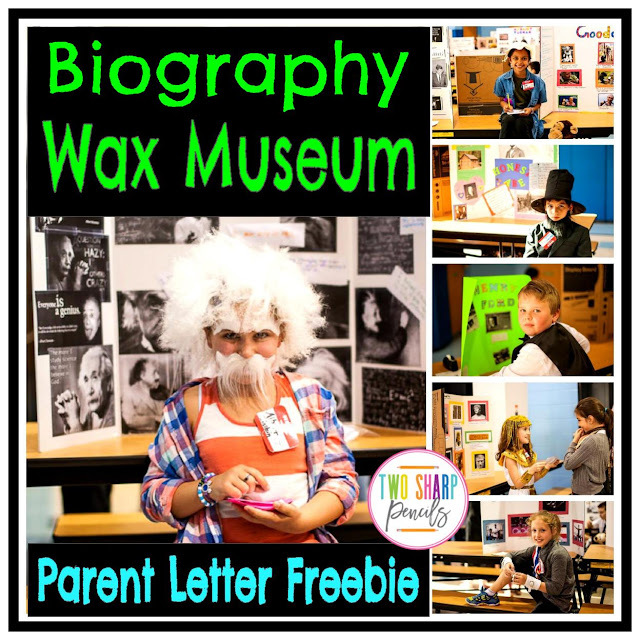 Welcome to Our Wax Museum! 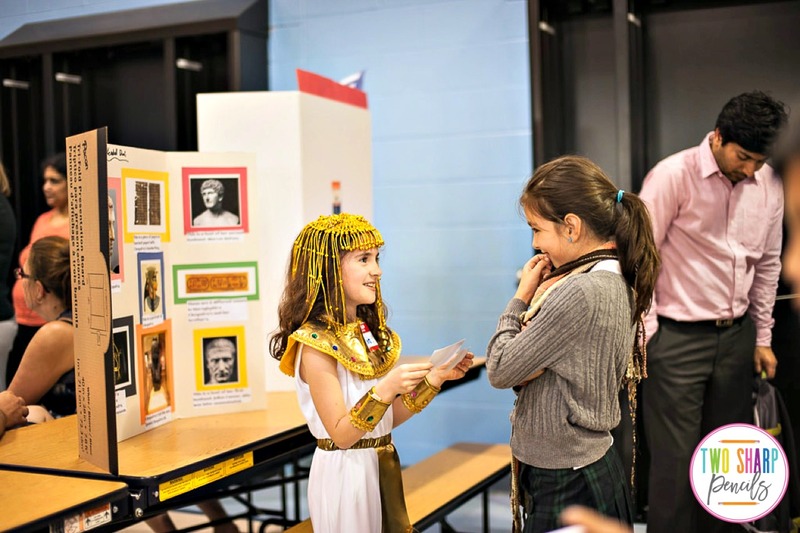 One of our favorite events to do with our students each year is our biography wax museum! We see the tired but proud smiles on the students' faces after they finish, and it always reminds us what a great experience it really is. We literally get to see their confidence grow right before our eyes and parents LOVE seeing their child perform. 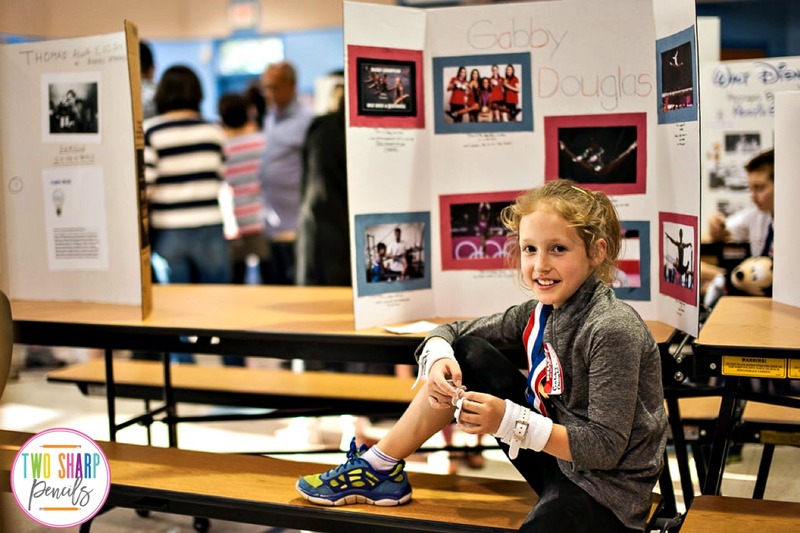 There are always exclamations of gratitude that we have given their child a platform to shine. Want to try it in your own classroom? It's easy, just follow these four simple steps! Our wax museum is the culminating project after we have finished our biography unit. 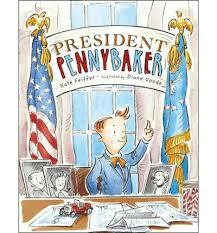 During this unit students choose a famous person that they want to research. We always stress to the students that at the end of the unit we will do a special presentation where they will need to portray the person that they choose. We involve parents in the decision so that they are well aware of this! 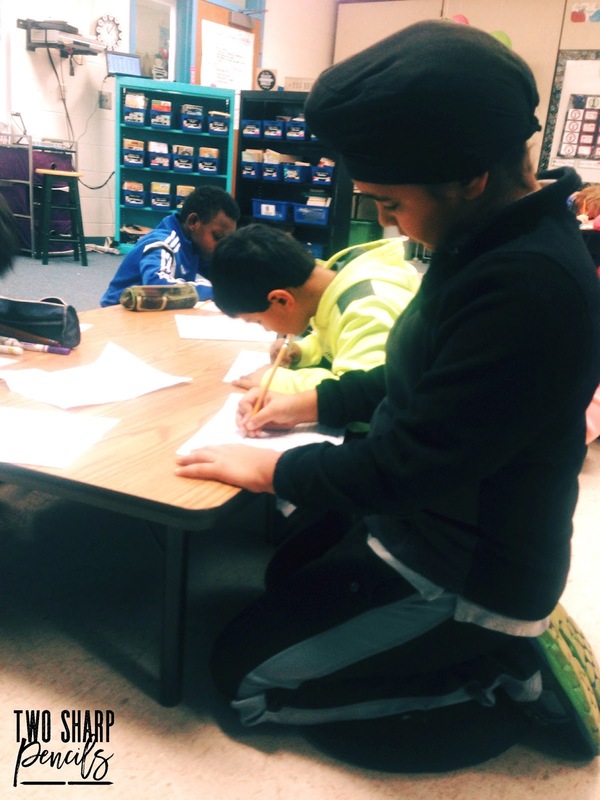 The students create a final report about their person's childhood, adulthood, accomplishments, and importance. When they have finished it, it is time to introduce the wax museum. We start off by talking about what a wax museum is and show pictures of actual museums such as Madame Tussauds. We tell them that they are going to dress up like the person they have studied and freeze in place; but what makes our museum special is that if you press a button they come to life! They create a 1-2 minute speech about their person’s life, speaking as if they really are that person (this is a good time to talk about using pronouns I and me). 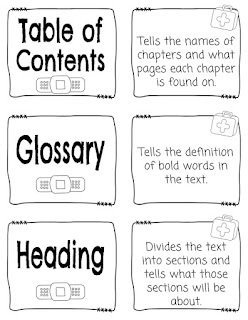 We recommend that students try to memorize it but we allow them to use index cards. They design a poster with pictures of their person at different stages in their life. 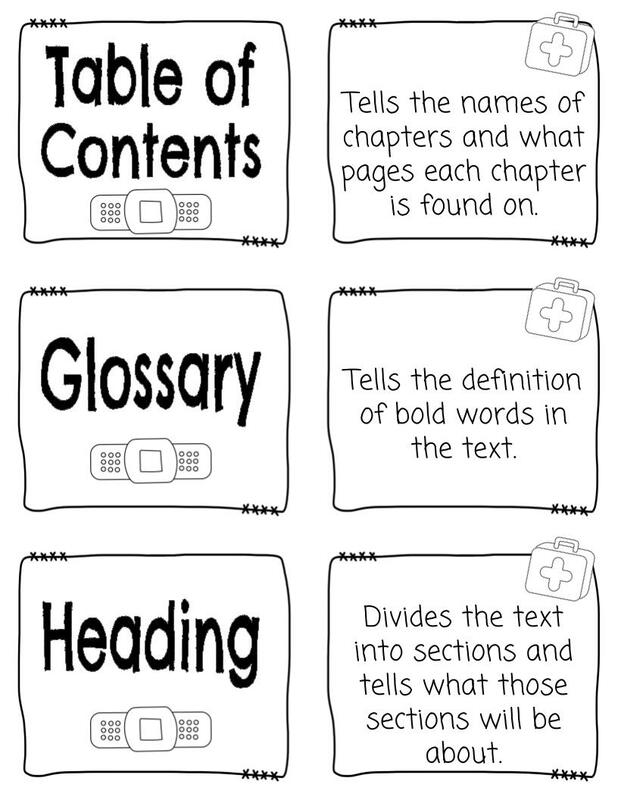 Tip: Have students get trifold boards if they can. They are easier to stand up on tables. They come up with a costume and props that will help them “become” their person. We always stress to students that they can use whatever they can find around the house. If they would like to purchase something, it is fine, but definitely not required. We usually give about 3 weeks for students to work on this assignment at home, making sure to check in with them each week. We schedule a day performance where classes from the school can sign up to come and an evening performance for the parents. Finally we have a dress rehearsal the day before the performance where the students bring their speech (without the costume or the poster) to practice. 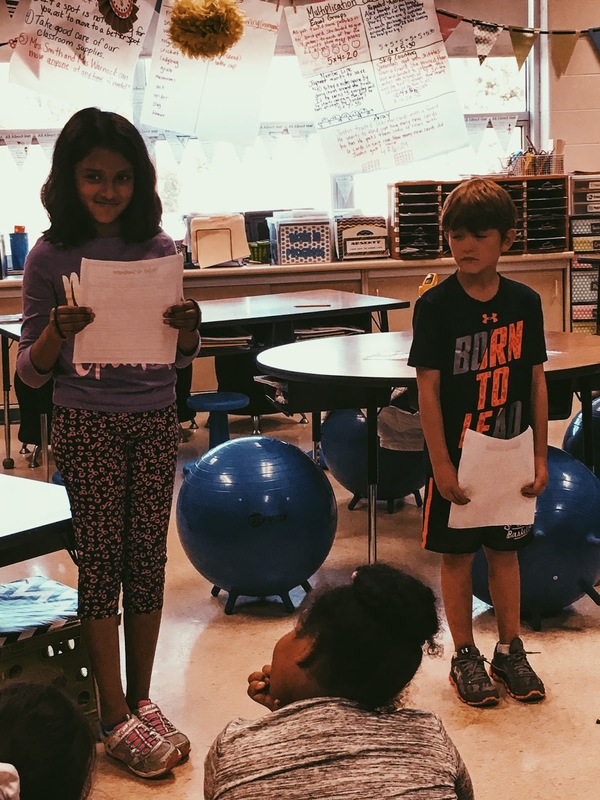 We tell students that they need to share their presentations as if it were the real performance, reminding them to use lots of expression and speak slowly and clearly. 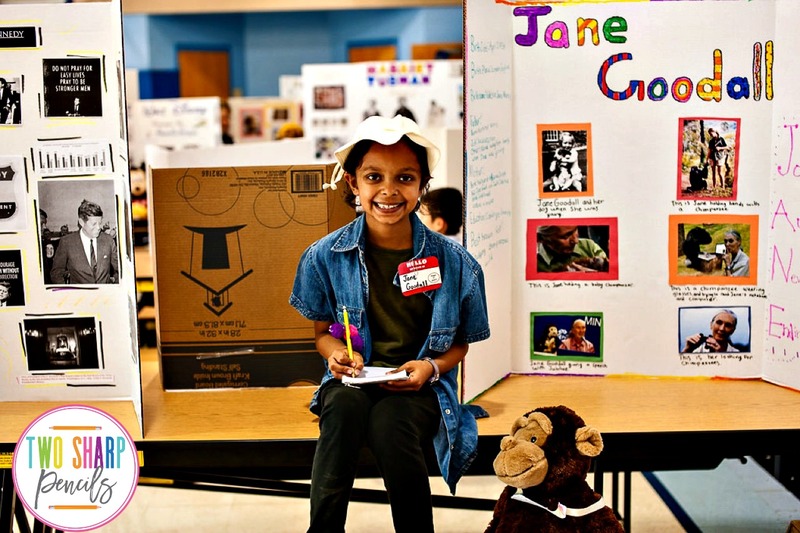 Tip: Grade the students on their speech and presentation during the dress rehearsal. 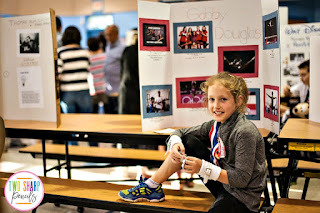 It makes it easier to grade only the poster and costume on the day of the actual performance. The dress rehearsal it is a good time to tell students that they will encounter different situations, especially when the audience includes children. They may have someone press their button and walk away in the middle of sharing. We tell them that if that happens they should just stop. Or if they have students pressing their button multiple times and being silly they can do the speech once and then freeze back into their positions. It’s important to encourage them to not get discouraged if these types of things happen. It’s a part of the experience. On the day of the performance the students get dressed and we attach their “buttons” using paperclips. They stand in front of their posters and freeze in a position. When the crowd comes in the students should be perfectly still. 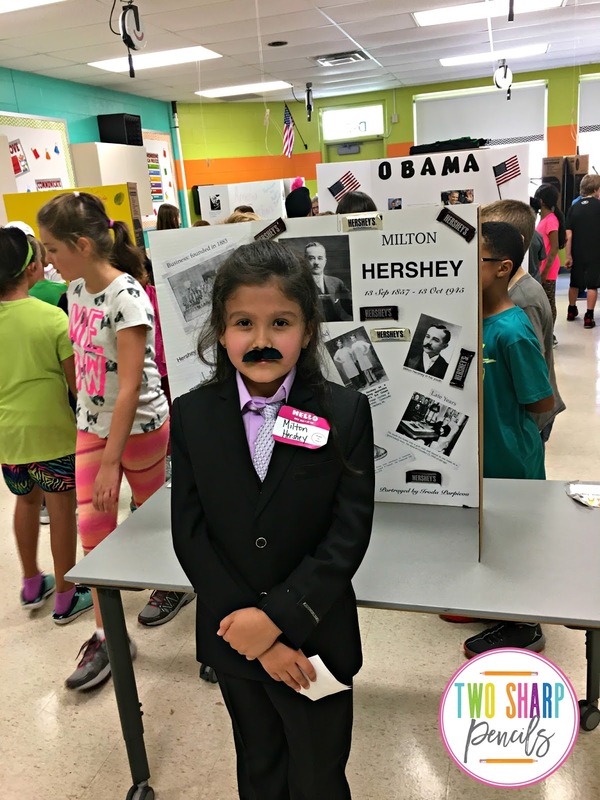 Someone presses a button and with that our wax museum comes to life! Putting on a wax museum may seem overwhelming but it's really not. It is a worthwhile experience that students will be sure to remember! 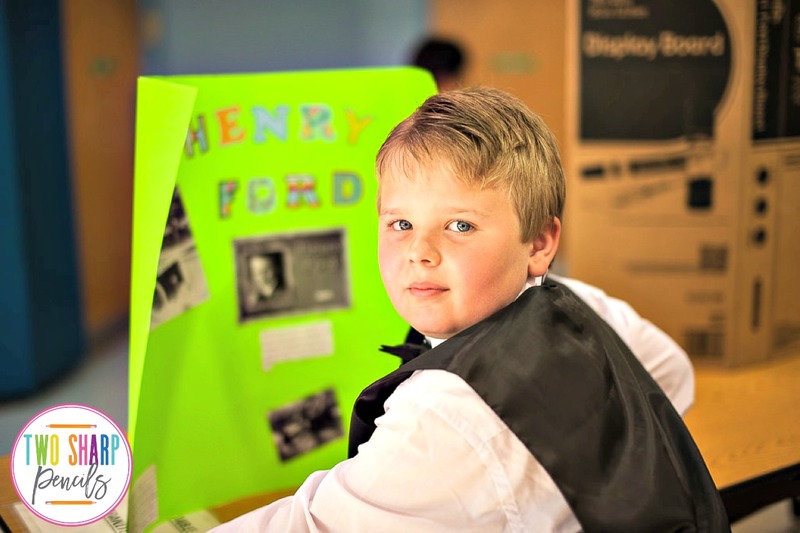 If you would like steps to help you from start to finish, check out our Biography Research Pack. It's the start of another school year and with it comes all of the excitement, anticipation, and craziness!!!! 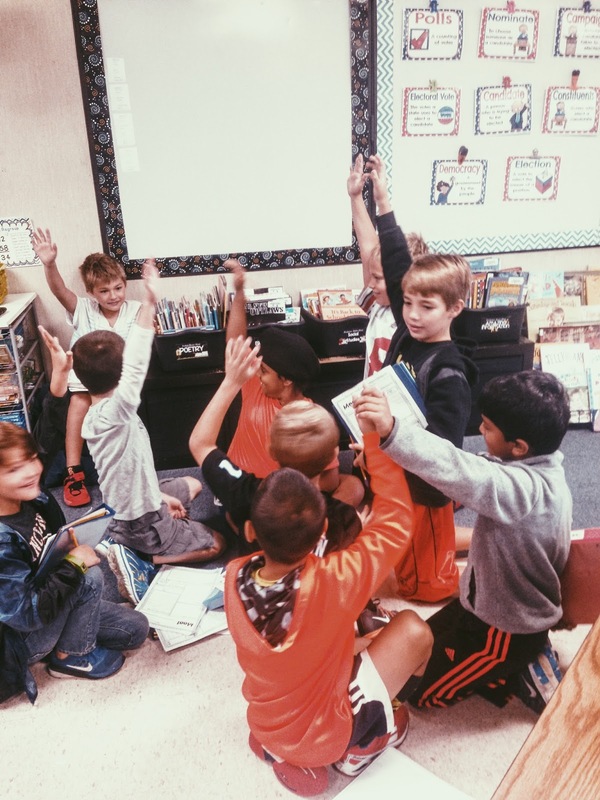 There is always so much to do once you finally have your kiddos in front of you-teaching procedures, getting to know them, reinforcing positive behaviors, etc. One of the things we really wanted to spend time on at the beginning of the year was helping students to learn how to work together. The goal being that we will have less issues with students working in groups throughout the year. 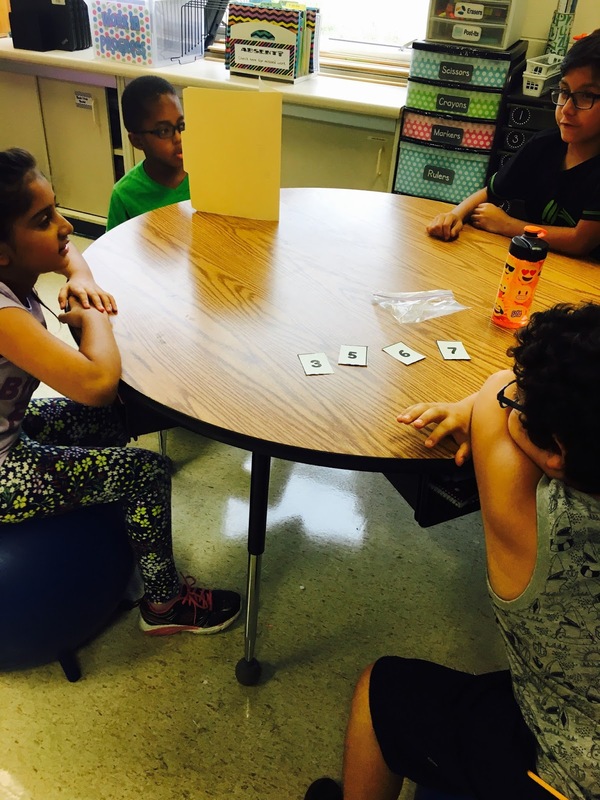 We decided to use some fun math games as a way to help them to get some practice with problem solving while working as a team. We did a different game each day and switched up the groups for each game. We begin with reviewing place value in third grade so we decided to create games that centered around this topic. 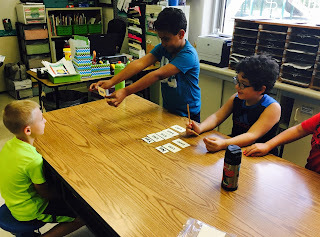 Check out the games that our students played! In this game students are put into groups of 4. There are 16 cards and each student gets dealt 4 random cards. The goal is to get the 4 cards that are connected with each other in some way in front of each student. 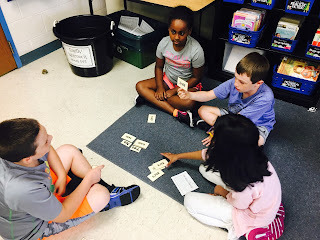 In this case, they have to get four cards that represent the same number in different ways (base 10 blocks, written form, standard form, and expanded notation).The only catch is they aren't allowed to talk! In this game the same 4 digits are passed out to one student and the rest of the group. That student creates a number and hides it. 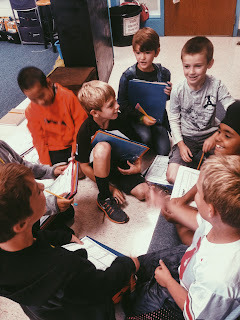 Then the rest of the group has to work together to try and figure out what the number is asking only yes and no questions that they agree on together. For this game, one student chooses a rule. The rest of the group holds up number cards and the student with the rule tells them if the number goes in the yes or no category. 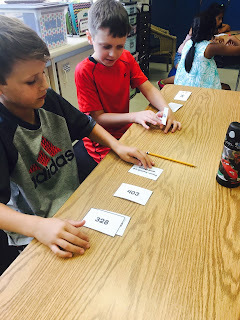 After they have sorted the numbers, the students must work together to try and figure out the rule! In all honesty, some groups struggled more than others at first in figuring out how to play the games, but once they caught on they had a blast! It was a great opportunity for students to really solve problems together and they were very motivated. 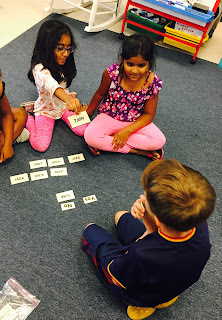 After we played the game the first day, a student came up to us beaming and said, "This was so much fun!" The words that warm every teacher's heart :). 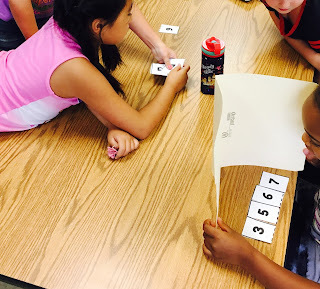 We would highly recommend you try out some math team building games as school gets underway. If you would like to try out these math games, they are a part of our Back 2 School Math Pack. Check them out here on TPT. 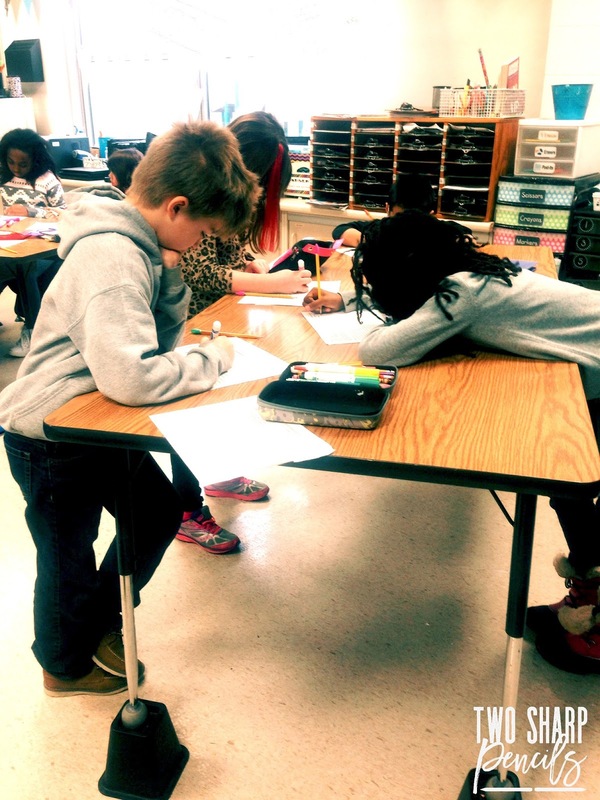 One of the hottest trends in the education world today is flexible seating in the classroom. We know you’ve heard about it, seen millions of pictures on Instagram and Facebook or seen it on your Pinterest feed. 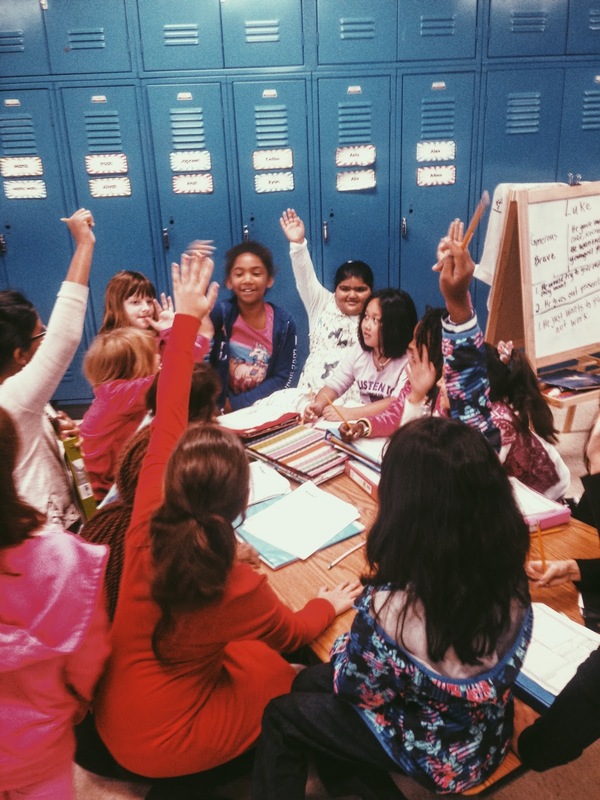 We all know that pictures taken of classrooms to post online are often times staged (aka….you won’t see any messy papers jammed in the desk, pencils on the floor, and all the books in the library are perfectly placed and color coordinated.) This blog post is as real as it gets! 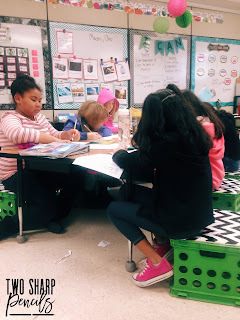 You’ll get to see our classroom in action and a true picture of how we implemented flexible seating. We’ll also share with you 10 mistakes teachers make when starting flexible seating and how to avoid them! 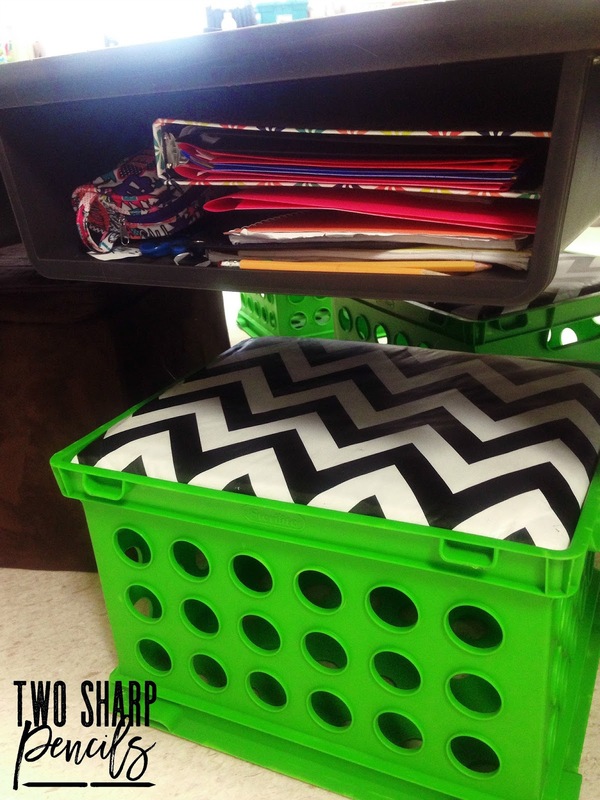 Before you introduce flexible seating into your classroom, it’s important to make a plan for organization of your students’ materials. What will you do with their notebooks, textbooks, and writing supplies? 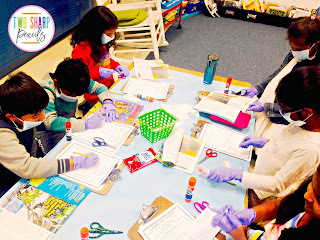 Will you share materials at tables or will everyone still use their own supplies? We decided in our room to have students keep their own supplies in a zippered pouch. They store all of their notebooks and supplies in a cubby that is attached under our tables. These cubbies are great if you’re lucky enough to have them. 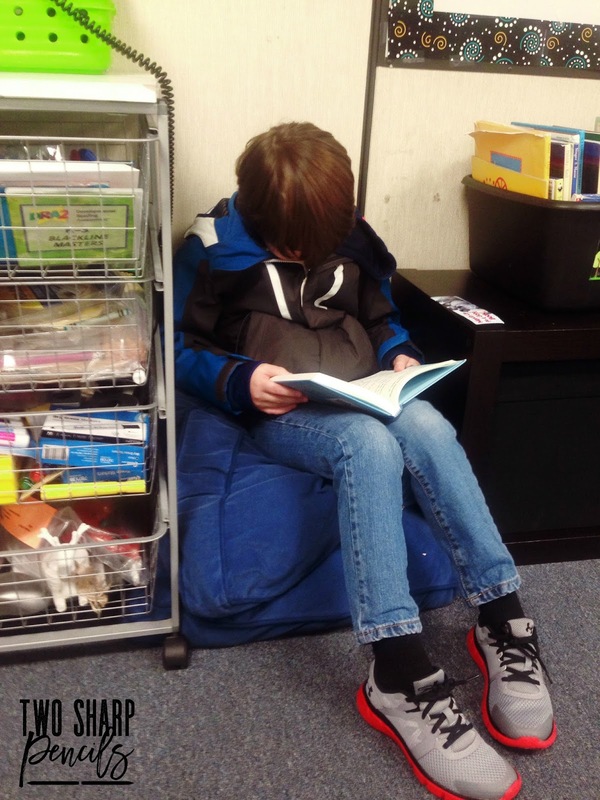 We assign each student to a “home base” which is where they keep their things. It’s also nice for taking attendance in the morning so you can quickly take a look around the room and know who’s absent that day. Throughout the day, our students visit their home base often to grab supplies needed for the activity we’re currently working on, but they don’t have to stay there if a different spot works better for them. You’re probably thinking right now, “Of course I would make my expectations clear!” Our tip here is to encourage you to take time to really show your students how to correctly use and take care of their new seating options. For us, we took a good chunk of time to first go over our general expectations for any of the seats. We had our students help us create a poster that we keep on display all the time. 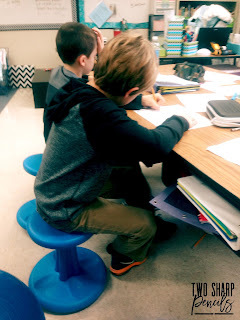 We also took a class period and went into detail with each seating option and talked about what a student should look like and sound like using that seat. 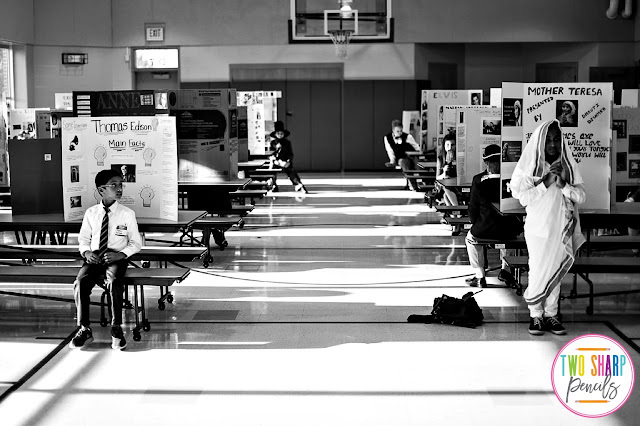 As with any procedure you teach at the beginning of the year, students will do it best if you MODEL, MODEL, MODEL and then PRACTICE, PRACTICE, PRACTICE. 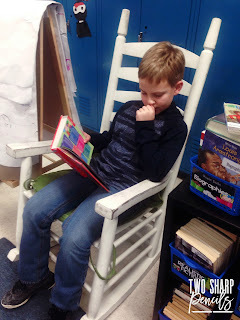 It’s helpful at first to give each student a chance at trying out each of the seating options so that they can practice using it correctly before you allow them free choice. 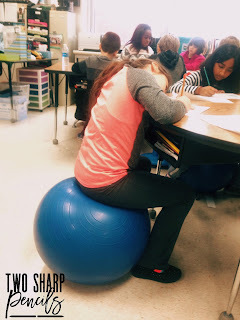 One of the biggest mistakes in implementing flexible seating is to initially take the time to teach expectations, but never revisit those expectations again. As teachers, we all know that it often takes several opportunities of hearing information before a student truly understands and can apply it consistently. The same is true with your expectations for flexible seating, especially after a long weekend or Spring Break. 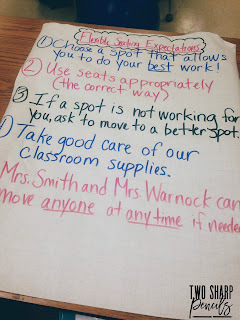 We keep our expectation chart up all year long as a constant reminder to students and we often refer to it if we see a student not using a seat in an appropriate way. Some people think that giving students the choice to pick a seating option that works best for them means that they no longer have any control over the classroom environment. This is simply not true! 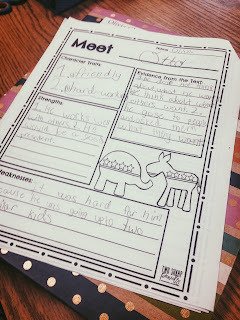 The most important rule on our expectation chart, and one that we revisit often, is: “Mrs. Smith and Mrs. Warnock have the ability to move anyone at anytime.” This is such an important guideline to put in place because there will be students who make unwise choices with their seats. They will choose to sit next to their best friend and try to talk instead of focusing on their work. 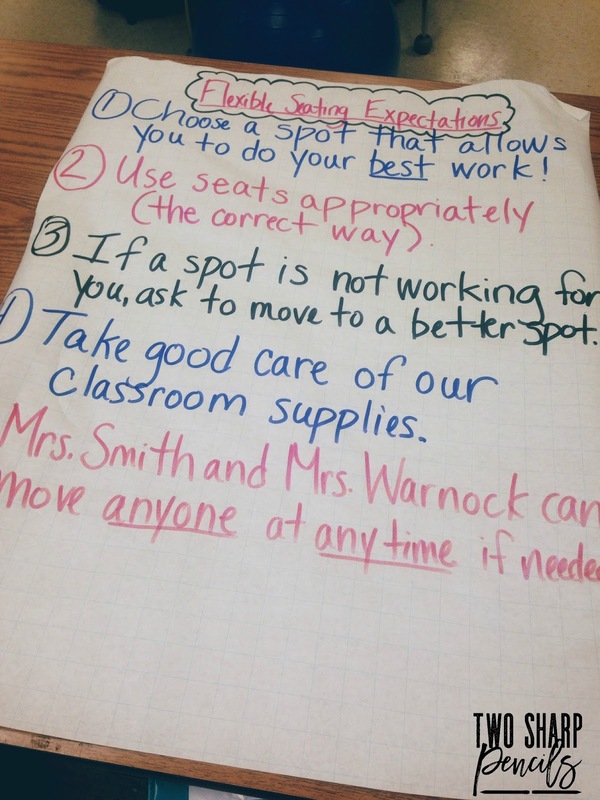 Having this rule on our expectation chart gives us the power to allow student choice while also ensuring a successful work environment for all. 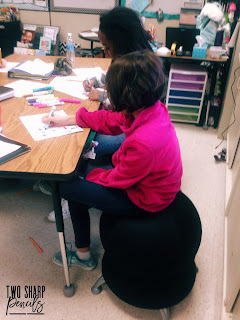 When we first heard about flexible seating, we were excited about the possibilities and wanted to dive in head first! While it’s exciting and tempting to completely overhaul your entire room overnight, we found that it works best to start small. Can you use anything you already have in your room and repurpose it? Are you able to take the legs off of a table to place it lower to the floor? Sometimes making small changes and implementing them slowly allows both you and your students to better adjust to the change. 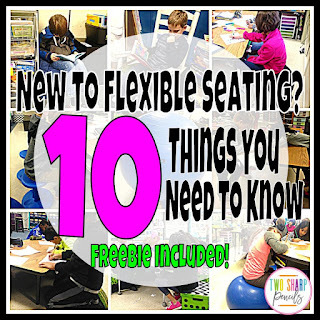 It’s also helpful to only introduce one new seating option at a time and wait until your students have mastered using it before introducing a new one. How much money did you spend on your classroom last year? If you’re anything like us, it was probably a lot. Implementing flexible seating will require an initial investment, but there are options that can save you a lot of money. Almost all of our seating was purchased by a grant through Donor’s Choose. All it required was a short explanation of our classroom and project to be posted. We signed up during the Target match, so much of our project was funded by Target. There are often companies that offer match opportunities, and you can sign up to receive email notifications when one is available in your area. 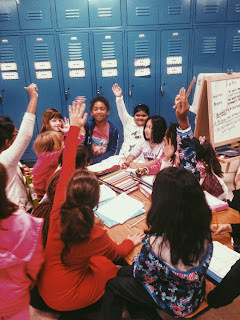 Here is a link to our funded project if you need ideas on writing your own.Your school PTA/PTO might also offer teacher grants, so make sure to check with them too! In our classroom, we allow students to change their seat throughout the day. We often notice that students might choose to sit in the morning because they’re not quite awake yet and stand in the afternoon after coming in from recess. If you think about yourself throughout the day, you probably notice that you have different levels of energy too. Allowing students the opportunity to pick the best seat for them at that point in the day is very beneficial. 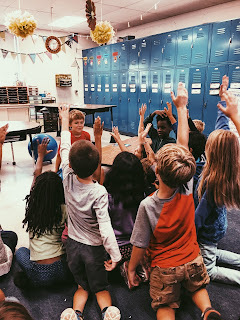 We have a rule that says, “If a spot is not working for you, ask to move to a better spot.” Having this rule allows students to become self-aware of their learning styles and helps them become more self-directed learners. Notice that we don’t allow them to move whenever they want (remember you’re in control!). Rather, we have them ask us if it’s a good time to move so it’s not too disruptive. Flexible seating is a huge shift in thinking from what “traditional school” looks like. 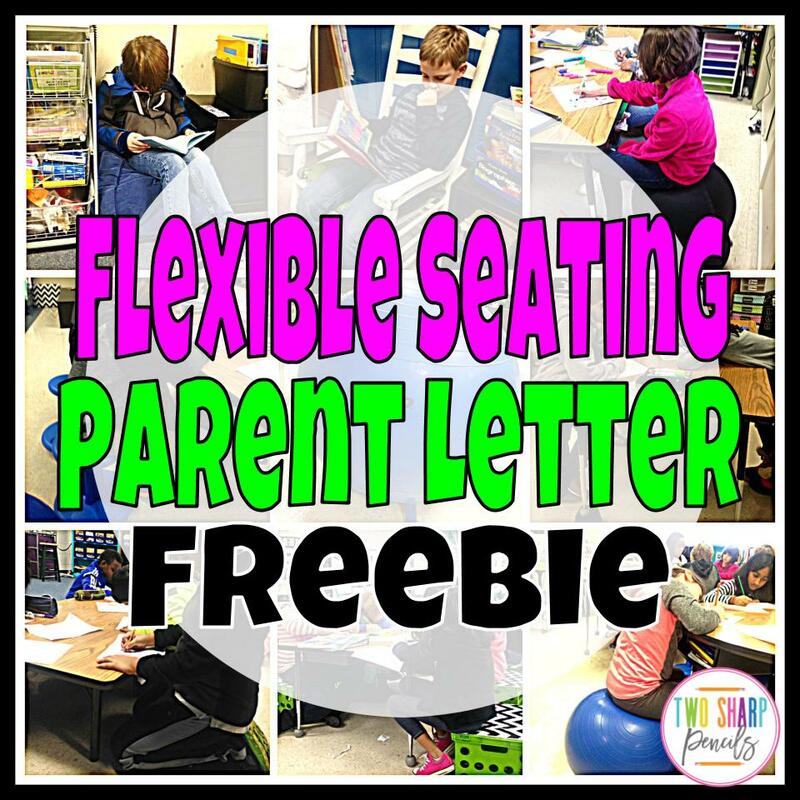 In our experience, parents and administration were much more open to the idea of flexible seating once they were informed about it. We included a paragraph in our teacher introduction letter that is sent out to parents during the summer. 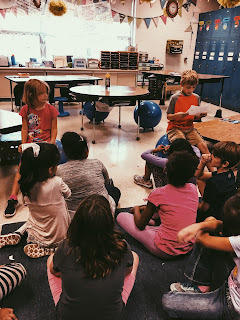 In this letter we stated that our classroom looks different from what they’re used to and gave a short explanation of how flexible seating works. This cuts down on the shock parents and students might feel walking into our room on Meet the Teacher Night. We also send home a more detailed letter explaining why we do flexible seating. You can get this letter for free in our store by clicking HERE. We all like to be comfortable and, let’s be honest, it’s sometime easier to do things the same way over and over again. It would be easier (and sometimes quieter) to just assign seats to students, but is it what’s best for kids? Sometimes it’s necessary to step out of your comfort zone because the benefits far outweigh the risks. This has proven to be true in our classroom. Implementing flexible seating has empowered our kids, increased student engagement and has helped us prepare our students for the real world. What an amazing journey that would never have happened if we stayed “comfortable”. 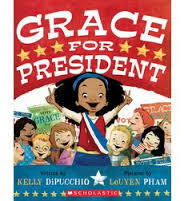 We just finished our election unit and the students had a blast choosing the winner of the election! 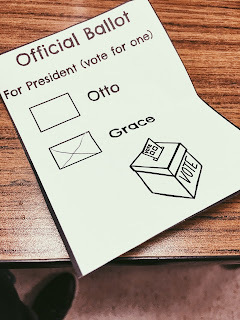 In the previous post, we talked about how the students narrowed down the four characters from books we read to them to two nominees: Otto and Grace. 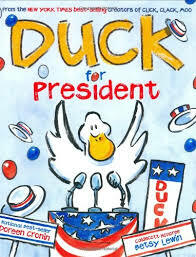 Next up, it was time to prepare for the debate. 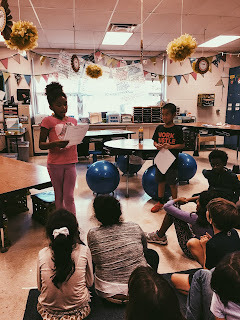 The students pretended that they were the nominee for their party and filled out a paper where they persuaded others why they should be the next president. Students then had the opportunity to debate with a student from a different party. A few brave students even volunteered to take questions from the audience and tried to answer from Grace or Otto's perspective. We loved how engaged and excited our students were during this election unit. We hope that you give it a try and let us know how it went in your classroom. Thanks for stopping by! 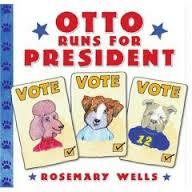 Then we decided to hold our own classroom election with the characters from the books as the candidates. 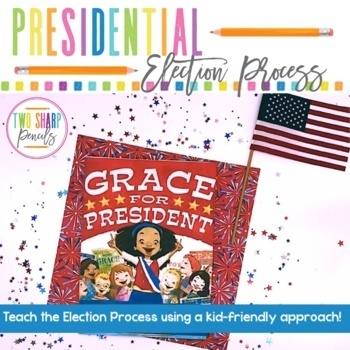 We discussed important vocabulary such as nominate, election, and constituents and introduced a new character each day by reading one of the books. 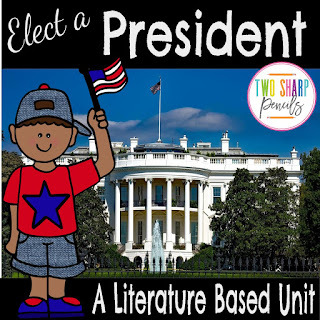 The students completed a story map for each book and filled out a character sheet that allowed them to take a deeper look at each of the "candidates". After all four characters were introduced, it was time to choose two nominees. 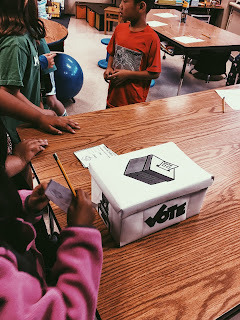 The class was split into two political parties and they came up with a name for their party. We assigned two delegates to each party. Then it was time for the national convention! 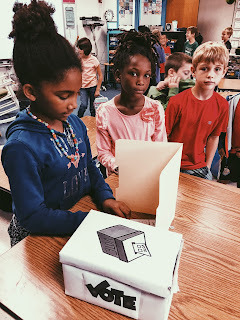 Students in each party were split into different sized groups to represent how states of different sizes contribute different amounts of votes. Each small group decided which of the candidates to give their votes to and each party in the end selected a nominee to represent their party. Our students chose Grace and Otto to be the presidential nominees! Next up our students will prepare for the debate and create campaign posters before the big vote. 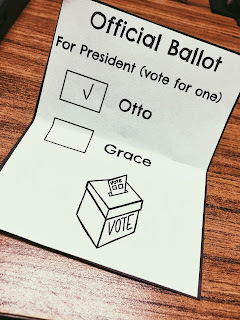 Stay tuned for the next post with the results from our class election! If you have any awesome election activities you do in your classroom, we'd love to hear about them! Thanks for stopping by!